Welcome to Kharis-Yeshar, or rather the eastern lands of the New Lands, Calenthya, where the 7 kingdoms of the Pact of Swords lie in revolt, war, and outright defiance of the invading Shak-razul of the southwest, against the Khan of Time, the Khan of Deception, whose forces move in shadows and on stone, in robes of fire, and armor of iron. Take up the guidarm, the flag, the mantle of your nation, guild, or Yah himself, against the forces of darkness and the principalities in the highest of places. 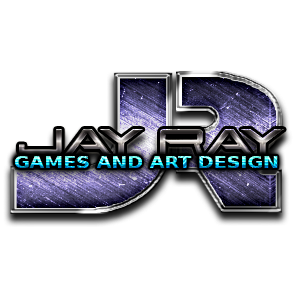 Courts and Courtiers, Guilds and Guildmasters, and malevolent forces stir in this story-driven action RPG by Jay Ray Games and Art Design, soon to be called Jay Ray Studios! I have envisioned a game that is somewhat different each time you play, a new world for each game, kept within only a certain amount of variables. That shop keeper that you remember being a Burly dwarf before? Now, a tanned vixen plys her wares. That quest that took you to the dungeon within the DragonSpine, now sends you to an opposing direction. 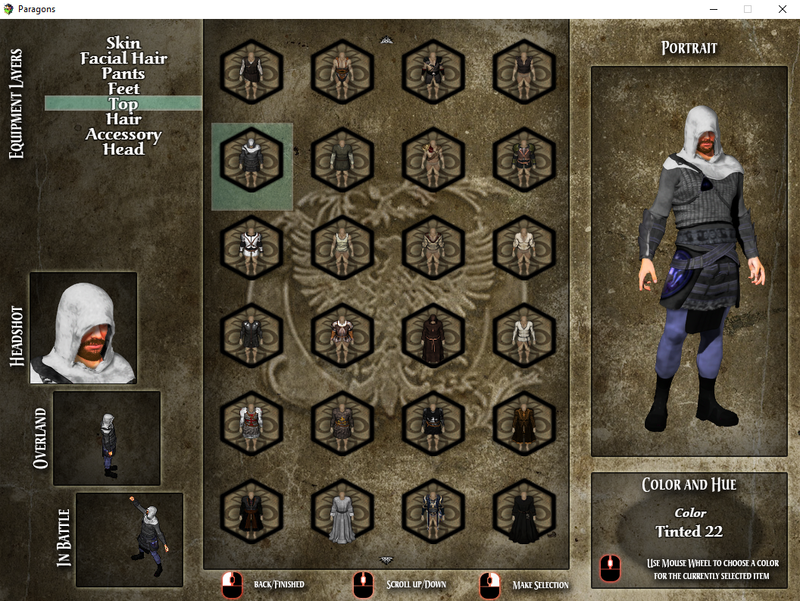 Using PVGames Medieval Sprite templates, along with a customized version of SunRndmDde's Character Creator EX, I have began to allow for the creation, or FORGING of your hero, who also may very well be unique, depending on the world. In all you'd be responsible for the creation of four such heroes, even though those heroes may not necessarily be joining your party immediately. Let's call them "long lost allies" that you search out the world to find. In addition, I have scripts that will automatically 'create' dozens of NPCs and name them with the help of scripts first introduced in the Judge's Guide Archaic Names. It's so hard to create a parallax map for each and every map you have, and can be quite a memory hog. Instead of that, I've gone a different route. Using Yanfly's Grid Free Doodads, I will create parallax archetypes. (Canyon path heading north, rocky ledge southwest, forested path, etc. In addition to that, the gridfree-doodads allows me to 'paint' each map as uniquely as if I had created a parallax map for each one. What is planned are over 80 variations of flora, 120 rock structures, and bits and doodads for the natural scenes, and relying on structures and items from PVGames, Artieria3d, and Dexsoft Games, and more to 'flesh out' each map specifically. Tileset passability is relegated to the Regions themselves. 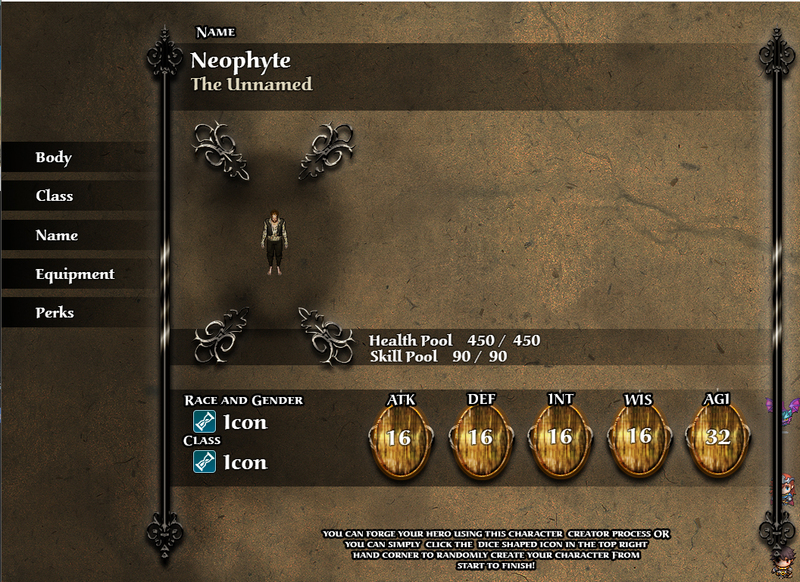 Ok, I mentioned before that many NPCs will be randomized within the game. While many of the key players may stay the same (Royals and defining characters), Using the same SunRndmDde's Character Creator EX, several characters will be generated on the fly at the start of a new game. This allows me to do two major things. Second, it allows me to have a TON of NPCs in the game, pre-loaded and set for use with the awesome power of having SO many actors available. Actor Faces also allow me to have a ton of different actors without consuming a lot of space memory wise. There will be quests, and a ton of them, all kept in journals that will easily be able to accessed from a quest journal. Whether I plan to have a seperation between the main quest journal, sidequests, and radiant quests is uncertain, but there will definitely be an emphasis on experience and fame points for those main quests. In addition to quests, hunting for puzzle pieces and recipies for non-written quests can help with immersion. (Spending an hour to get enough wolf pelts to create a set of Wolfpelt Leather Armor for instance)(Spending an hour mining, smelting and casting a suit of Glasteel Cuirass)(Hunting down enough herbs to create an herbal poultice or ingredients for a blank scroll) It's assumed that you should be able to make in game everything that can be sold in game. Items should also be able to be enchanted and modified. I was going to use Kino's EIS Librarium, but while the plugin has tons of options to work with, it doesn't address flagging the book so that map locations and clues can be "learned" by reading the book. This is crucial for the so called "Speak Friend and Enter" idea, where a book tells you how you can learn it. I want this to happen so badly, where map locations and more are LEARNED from various books and scrolls, skills are added, even profession points are earned. SO, with that said, unless I find another version, this will instead be done with common events, that cycle through pictures and ensure that the player can move from page to page and "read" the clues. Merede shares the continent with six other nations called together in a loosely based alliance called the Pact of Swords. These provinces are free to war with one another, but seldom do, instead unifying their forces against the Khan of Time's forces, in the kingdoms outside the Pact. In addition, there are several other factions that consider themselves outside the pact and free of the confines. 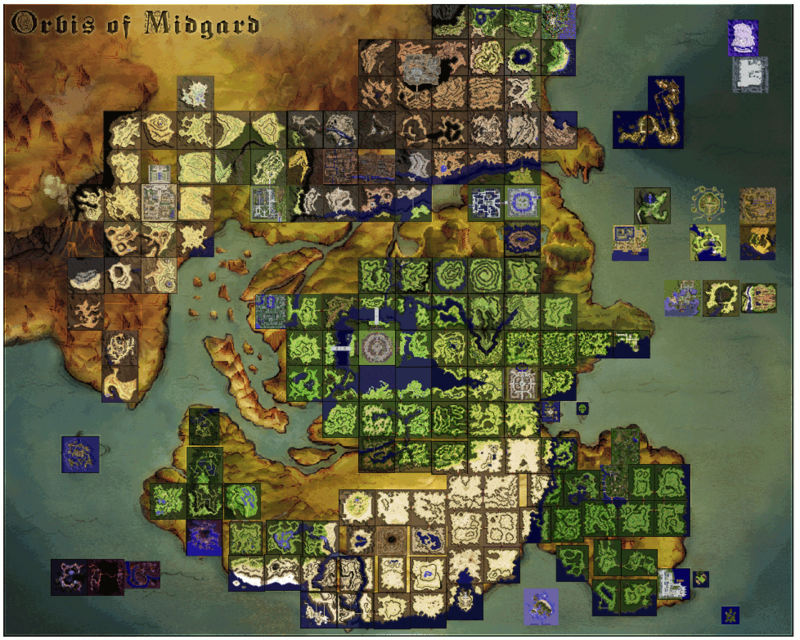 In this game, to show the true size of the continent, you can NOT overland walk to all the different lands, but you can choose map-points ALA Dragon Age. Sharistae - Hugging the eastern shoreline of Kharis-Yeshar, Sharista is often referred to as the Silver Coast, both for the high concentrations of Silver ore, as well as the devotion to an agent of Yah, Aaliana, the Silvermaiden. Ruled by Queen Ariste Dhamaer, Sharista bolsters a grand navy whose armada is unrivaled and helps repel any attacks from the old lands of Yesharya. Queen Ariste's rule is only rivalled by a rebellious province in the north called the Starthrone Brotherhood, who in a great seige took Sharistae's northernmost city of Kharlae, as well as the Isle of Saraava. Merede- Merede is a feudal land ruled once by King Hyvaron Mascul until his assasination in 1512 AR. Beseiged by warlords in the west seeking glory and riches, from the north by Haz-Reydi cheiftains, and in the east by the draconic thralls of the Spine-Thorn, Merede struggles to assert dominance in its own lands, much less to help beleagured nations like Gharail to the south, and Jemiscra to the west, as the brunt of rebellious warlords in Jemiscra's eastern lands make travel and commerce difficult at best. Jemiscra - The Empire of Jemiscra, once one of the reatest and feared empires of the entirety of Calenthya, is now in ruin, the Three Kings of power splintering their views into three disctinct factions, each loosely coming together only in matters of state, and each seeking resolutions that give them power over the other two. Warlords hae even sought there own power, as they feel they are loosely allegiant only to the lands of Jemiscra, not the bickering royals. New Jede - Enjoying the power vacuum left behind, New Jede has annexed and liquidated several surrounding provinces, in hopes of gaining the power and prestige that Sharista in the far east currently hold, Currently ruled by Vath Ryvari, Holder of the Chalice, New Jede, otherwise known as Jedea, was founded and settled by the direct survivors from Jede in the Old Lands during the Third Reckoning. New Jede is also primarily elven in population, being one of the largest such bastions of high elven power in the land. Haz-Reyd - In sharp contrast to the High Elves of New Jede, Haz-Reyd is the bastion of the Red Elves, the Reydi, who revere and are ruled by a Dragon King called Khar-Haz, or "Arm of Haz". The Haz-Reyd are very tribal by nature, and more warlike then their counterparts from several centuries earlier. Their main seat of power, Haz-Varak or "Heart of Haz" is actually the ashen field of a now extinct volcano. It is believes that beneath the volcano's caldera, lies the actual citadel where Khar-Haz rules, but outsiders are very seldomly invited in, and much less are allowed to look upon the revered leader. Sorason - Known as the Crystal North, Sorason lies to the northwest of Jemiscra, and bolsters a cold environment, and a tough, hearty populace of humans who don't worry as much about the fight against the Khan, instead with battling the throngs of Orcs from the various clans within their holds. Gharail - Known as the Lion of Calenthya, Gharail is ruled by the high Paladin of Yah, Marson Dramiir, who commands his forces well. However, forces plot against the Lion Crest, like the denizens of the three Sisters of Malice, Adra, Siithra, and Veshari. Steep in superstition and lore, Gharail has tracts of lands that do not revere Yah, but instead rely on the dark ways of the sisters, and seek not only Marson's downfall, but the removal of Yah's worship from all of Gharail. YOU - After choosing your body, your class, your equipment, your perks, your land of origin (ALA Elder Scrolls), and your family name within those lands, a modest by enriching storyline explains your rise from a child to who you are today. I relied heavily on Paul Jaquays Central Casting for the storyline idea, and have thought about using it to create a DYNAMIC storyline backstory. Allies - Like you, each ally will have a specific backstory created for them, but also like you will be UNIQUE per each game. Check out subsequent threads for screenshots, development blogs, and other information about Paragons! Hey, who... are... you, who! who! who? who? 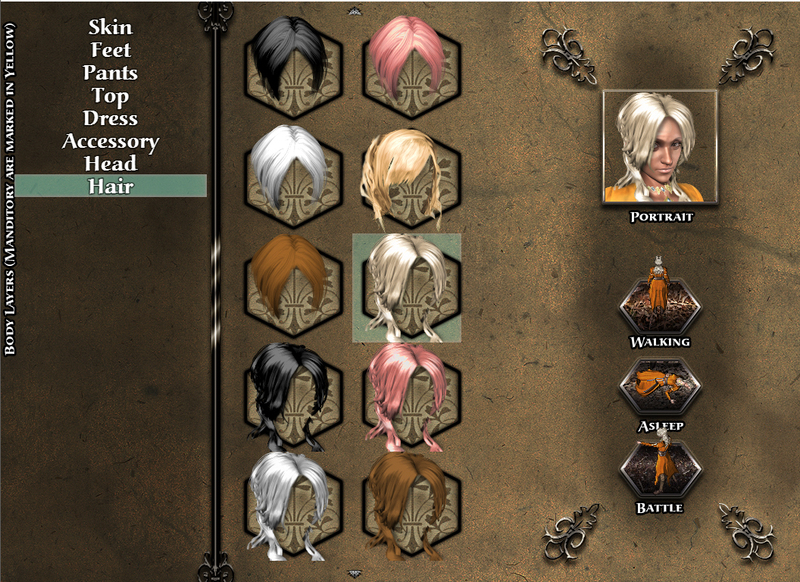 Sorry, had to get my humming along as I showed off a few screenshots from the character creator for Paragons. Using a slightly edited plugin and data file originally and generously supplied by SumRndmDde... I have edited to allow for male and female and with some editing, will have Bust or Paperdoll integration soon as well. This is the main actual generation screen, which will have buttons that will appear once all five menu options have been entered and an item has been chosen. Never mind the little RTP characters on the lower right, they're there to toggle a few items, but that big space on the right will be to show a common-evented or HUDMaker layered Paperdoll or Bust of the character. As you can see, stats are set dependant on classes and upon perks, storyline and equipment. During a prequel process, upwards of 500 Actors may be randomly created to ensure that there are a wide range of characters, each with their own names and nicknames generated. While these WILL be Actors as part of the game, they may not be actually played, but used as markers for events to ensure that the events carry those same random attributes to the map. But, with that said.... UPDATE!!! There are currently, I believe 12 clothing layers that can be adjusted, and in addition to skin and hair and facial hair, there will be two other layers... First will be Scars and Marks, the second will be Paint and Tattoos... These will be artistic addons outside the PVGames sprites. Second, I finished the upgrade to the new Yanfly Doodads plugin as well as a vastly updated Moghunter Fast Travel plugin... Doodads now will show or not show based on switches (very nice), and my fast travel script allows for me to plot each and every dungeon, town and castle in a map-condensing way. This RPG would be too big to be true open world, but I still want to have region maps for some large areas... This allows me to do both, including spiderwebbing some maps together for exploration and immersion. You will be able to create over 16 million starting characters, something that I don't believe I've seen in a 2d game. I'm not saying there's not one out there... I'm sure games like Ragnarok Online and such come close, but dynamic actors are definitely the theme here. With that being said. In IRC tonight, I had a brainstorm, regarding the idea of being able to choose different items, plugins, and methods of adding things like armors, I really want people to be able to diversify, but not at the cost of potentially game-breaking metagaming, where you instantly flock towards the Fullplate. However, I'm going to make that part of the game story itself, NOT a metagame character build process. 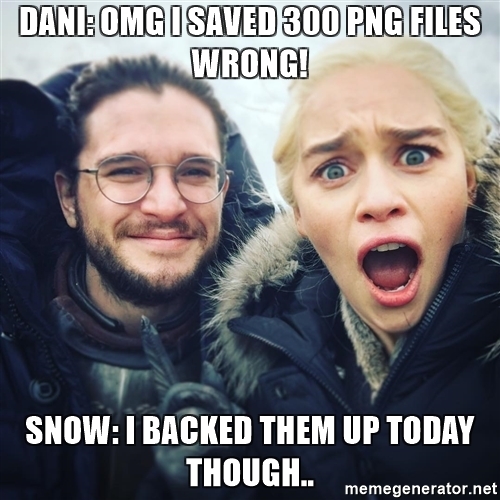 BACK UP YOUR WORK DAILY! What's been going on with me, you ask. * I was successful in getting all my main character pieces in for customized characters, but took them out so that I could work on a more compact naming convention that will allow me to better keep track of each individual item, so that instead of Fdress (1).png, I may now have mffdrs1.png , or mifhr3a.png - This will help me tremendously in the coming days and weeks of preperation. * I am also able to resize and enlarge some of my older RMXP and RMVXAce png files with a fractal software that 'seems' to take away the pixelization that often comes from enlarging. So, I may be tweaking SOME settings to allow for both those pre-generated characters AND my custom MV characters on the same playing surface. This is a map of Ragnarok online, where for the most part everything is small maps that are connected to each other from within to without... easy to draw a landmass around that to better illustrate what the total map is. My main atlas map is approximately 6400x6400 and while play area may still only be a small portion of that, it's still HUGE when you factor in the various distances between points. So, I either have to REALLY show down character movement on one map that's around 150x150, or try to zoom in even MORE, which will bleed out the features that I've worked hard to get to look nice in my world mapping, all without any assurance that it will make the game FEEL any better... as more people it appears would rather just point to a map to get to a destination than walk there and search it out. I think I should start a poll for just that question. * However, there's been a LOT of progress in the brainstorm departments. In addition to the main story game, I will (instead of having it all on ONE main game) have side RPG games called Tales of the Paragons - which will be much shorter RPGs with pre-generated heroes, villains, NPC, all like seasons and episodes, that will be able to be downloaded each month. Again, these will not be DLC for the main game but each their own seperate mini-game. Before, in earlier revisions of what I was trying to create with this game, I wrestled a lot with the idea of having pre-built characters that you just choose and go with. Visual Equipment was going to be sacrificed for the large number of choices. In this revision, I WAS going to just always have you choose to make your own character. What I have NOW is a system where 20 heroes of specific builds and enhancements would be available, all with visual equipment available to be changed on those characters, all while allowing to choose either a new Hero or female character, for a WIDE range of allies and hero options. I have decided that I would also allow the player to start out with one person, two people, or three to start the game, and choose either custom created characters OR the pre-made heroes in any party order to start the game with. This is what I'll be working on next, and hopefully this weekend I'll have new pics! It's my birthday in 5 days! Alright, ladies and gentlemen, and the occasional lyncanthrope, its that time for a little bit of a development blog. After dealing with a minor setback, I now have paperdolling portraits as well as faces, sideview battlers AND the default walking character sprites. I'm now going to be spending the next couple of weeks adding to it, frankensteining bits and pieces together, changing some color palettes, and changing some items to make them more unique to my campaign. All those equipment choices but WHY? Well, that's a good question, and here's hopefully a good answer. 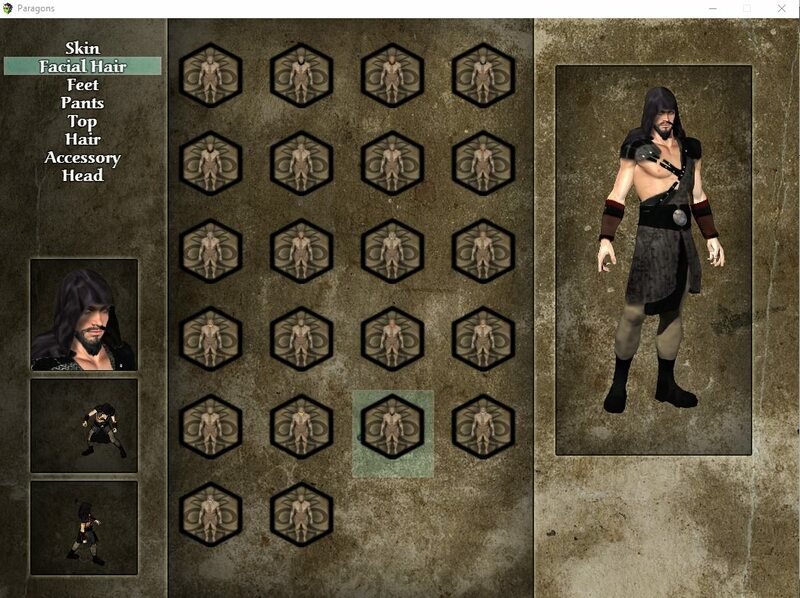 In Paragons, a character's outfit affects several factors, not just to determine what he looks like but what bonuses he gets. When you have a suit of armor equipped to your character, it visually changes the character and imposes those changes. Now, unless I want a simple "Leather, Iron, and Magical Iron Armor" I need to have different prices and bonuses for items, and put rarer items, armor, and equipment in higher-risk dungeons. for that reward, and to help the build factor. Likewise, there are some equipment items in Paragons that when equipped, add or detract from interactions with NPC dialogue. Tabards and Coats of Arms - Just like you can't go up to a Green Bay Packers fan while wearing a coat, scarf, and wool hat showing the Chicago Bears, you shouldn't walk into a faction's guildhouse, wearing say, a rival's garments or coats. Likewise, you wouldn't want to wear the standards of Jemiscra in the heart of Merede. As of now there are 10 equipment slots, and while some of them can't be edited or changed once you choose your starting character, there will be many options to build your character for survival as well as make it asthetically appealing as a character. And about those items you can't edit? - Well, if you choose to make your own character, There will be some choices you make to have that unique character that once done, can not be changed. Right now, here's how that's breaking down. This number may change as I decide how to change and add things like newer faces, eyes, and more. THAT's OVER 20K possible people! * Right now, I'm trying to finish up everything graphically for the character generator, so that I can test my first true 'deployment' in various environments. 1- Using the mousewheel, I finally was able to edit the SRDude's Character Creator EX to allow a quick roll of the mouse to get any number of preset hues. Click and BAM you've got red leggings! Click again, and you got lime green! 2 - I was successful in integrating the full body pose in my character generator, ala Daggerkeep! Plus I substituted the 'dead' pose, so that if I need to have the portrait in any other scenes, or have event based menuing systems I can use the body for new and unique menus. -----> I'll be removing the word COLOR from the title above the color... that was an unfortunate error on my behalf. NEXT Edits: I'll be working on adding 20 or so new faces to the game, for even more varied outfits, as well as WARPAINT!, TATTOOS!, and EMBLEMS! Warpaint - streaks across the eyes, painted skulls and more ideas across the face and torso of the character. Tattoos - Make it permanent with intricate marks and powerful totems. Emblems - Why wear a simple shirt, when you can wear a shirt with the emblem of a dragon, or your town's emblem, who knows?